This product will add 1.53€ to your cashback account. 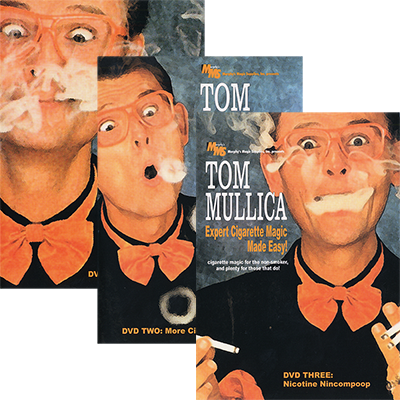 Murphy's Magic Supplies, Inc., is pleased to announce the release of Tom Mullica's Expert Cigarette Magic...Made Easy! on Download (Available separately or as 3 Volume Set). This remarkable collection contains basic to advanced magic with cigarettes, matches, cigars and anything else related to smoking. Of course, the topper is that on Vol. 3 he finally tips The Cigarette Eating Act! answering that age-old question: "Where in the heck did those cigarettes go!" As a bonus, Vol. 2 also contains Tom's F.I.S.M. act, and Vol. 3 also contains a performance of Tom's world-famous stage act! Vol.2 - More Cigarette Magic! Performance of Tom's F.I.S.M. Act! Saliva VanishComplete performance and explanation of "NICOTINE NINCOMPOOP" the Cigarette and Napkin eating Act! Performance of Tom's World-Famous Stage Act!